If you haven’t noticed, the mobile photo sharing space has been exploding lately. Facebook, Google+, and Twitter are all including photo-sharing as a major feature in their mobile apps. Smaller startups, such as Instagram, Path, and now Pool Party, are starting to get quite a following as well. Instagram continues to be my favorite photo-sharing app for the iPhone. It’s simple, and the filters can make any photo look sweet. But the new Pool Party application has really piqued my interest and I’ve been using it heavily over the past week. I first heard about Pool Party after reading a TechCrunch article about it at the end of June. The service sounded pretty interesting, so I decided to request an invite in hopes of getting a chance to check it out. A month passed and I had completely forgotten about the service until I received an email with my invite. I created my account and was immediately impressed with the application. 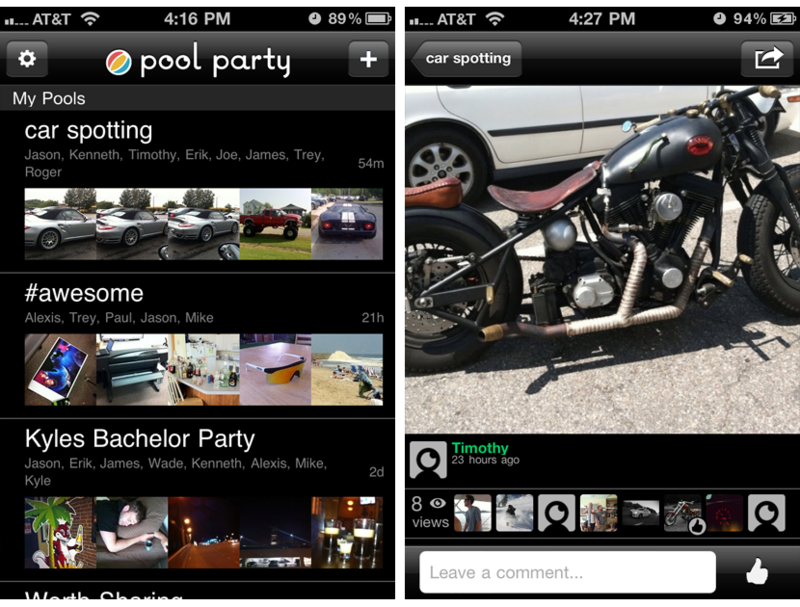 The main feature of Pool Party is the ability to create “pools” and then invite people to be contributors to the pool. Basically, it’s like a shared photo gallery with a bunch of photographers adding photos, comments, and likes. If you’re hanging out with a bunch of people who are all using the app, it turns into an amazing time. 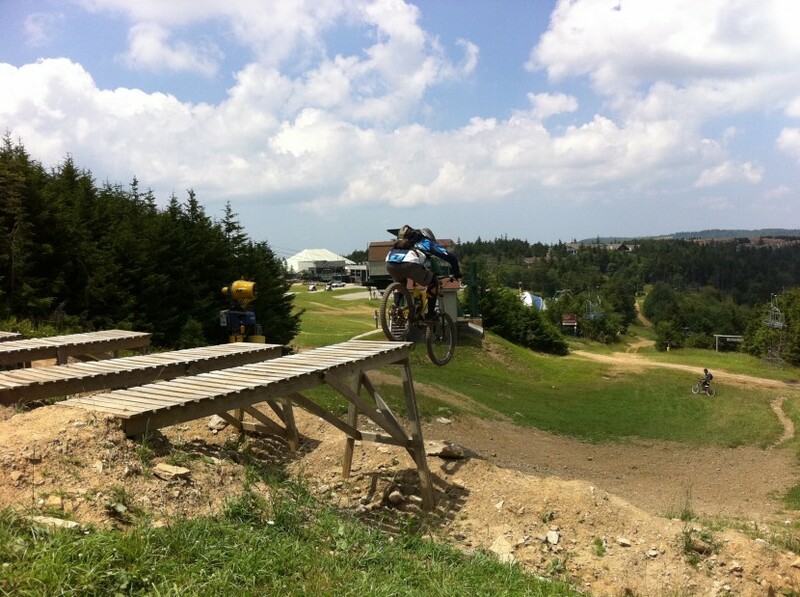 Two weeks ago a couple friends and I headed up to Snowshoe Bike Park in WV for a weekend of downhill mountain biking. This was my first trip downhilling, but I generally do 3-4 days of cross-country mountain biking each week. The allure of downhill biking is a combination of lift access, big bikes, speed, and lots of jumps. Snowshoe was running two lifts to shuttle riders (and bikes) back up the mountain to access 1500 vertical feet of rocks, roots, and dirt jumps. Both sides of the mountain were open and the weather was fantastic all weekend. Dave hitting the big drop at the top of Snowshoe. I installed OS X Lion (10.7) this week on both my personal and work Macs. I spent some time over at RoaringApps.com checking application compatibility for my frequently used applications. Everything was reported to be working fine in Lion so I decided to take the plunge and upgrade my OS on the first day it was released. The upgrade process was extremely smooth. I followed this Mac Rumors guide to create a Lion install DVD using the file that I downloaded from the Mac App Store. I used this DVD to install Lion on my second mac so I didn’t need to re-download the 3.74 GB installer. This went very smoothly. Impressive! The first thing you see when you begin to use lion is a new login screen. It looks pretty cool and gives you additional details in the top corner such as wifi connection, battery percentage, and the time. After logging in you’ll see a dialog titled “Scrolling in Lion”. 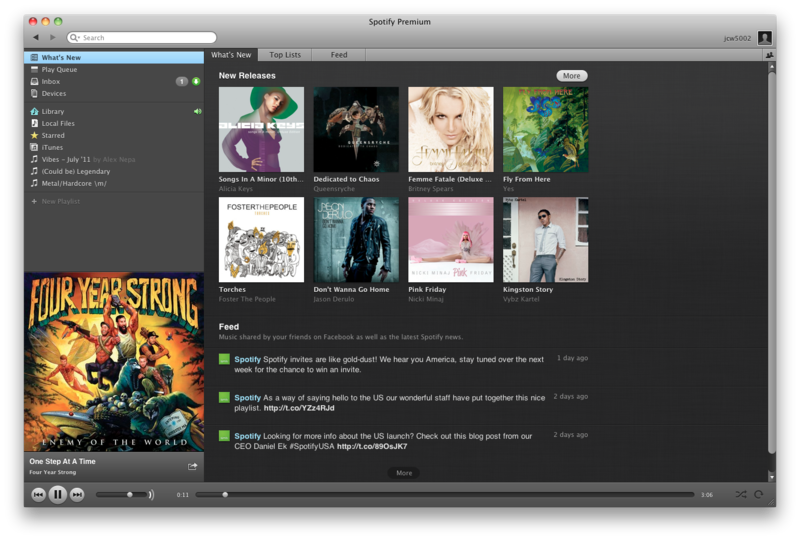 As you may have heard, Lion essentially inverts the scrolling so it behaves more like the iPhone and iPad. This is probably the most talked about thing in Lion simply because it’s such a drastic change to something we’ve been using for over two decades. I’ve been using the new scrolling for a couple of days now and my brain is mostly trained. If you have an iPad or an iPhone, I would highly recommend sticking it out and learning the new scrolling method. After a week or so, I think it will feel completely natural. 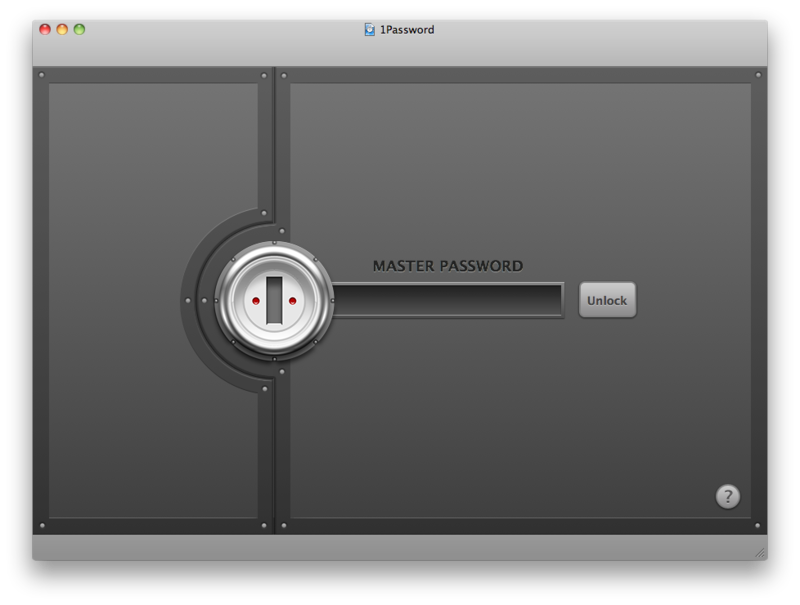 Not a user of 1Password myself, I was unsurprisingly a bit offended by the “idiot” remark. ((In Ben’s defense, he did post a follow-up clarifying the statement and explaining his reasoning a bit better.)) Especially because I consider my password management skills to be quite sufficient. Sure, I’ve heard of 1Password and KeePassX before. Many of my friends and coworkers use these type of password managers. Prior to this weekend, I had made a concious decision NOT to use this type of software. I had considered it on many occasions before and had always decided it wasn’t for me. Well, the above quote got me thinking and I decided to spend a day or two revisiting the topic. I’ve been thinking a lot about the Mac App Store lately. The store is essentially the same thing as the iOS App Store that exists for iPhone and iPad devices, except for Mac OS X applications. The App Store makes it extremely easy to download and install free and not-so-free software. The store features the same familiar screenshots, ratings, and reviews for applications that you would find in the iOS App Store. The Mac App Store was released in late October 2010 during Apple’s “Back to the Mac” keynote event. 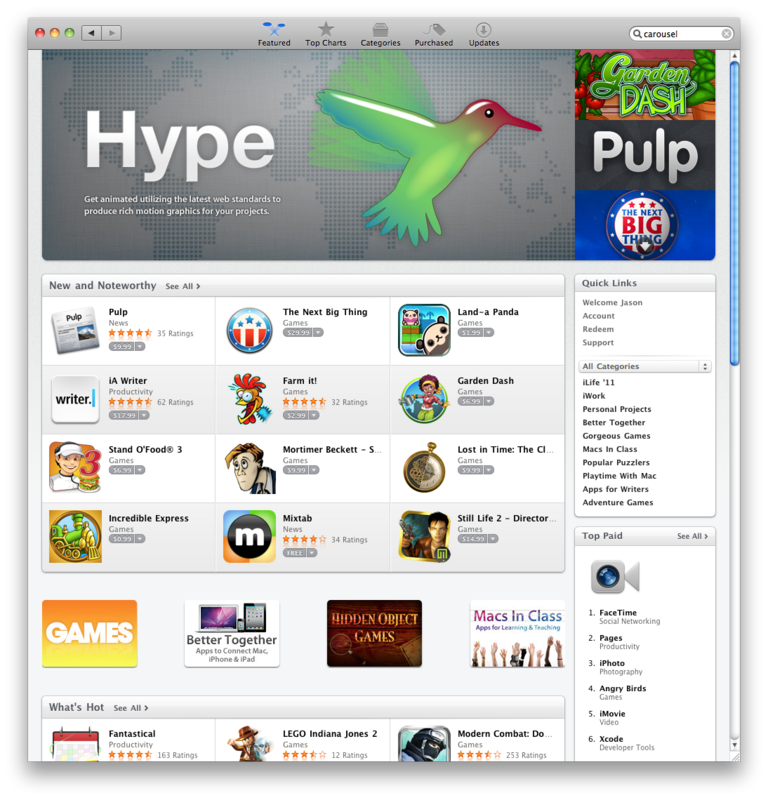 The App Store currently runs on OS X 10.6 Snow Leopard and above. When the Mac App Store was originally announced, I was completely taken by surprise. At first the App Store didn’t seem like such a great idea. Why do we need an App Store for the Mac? It’s easy enough to search for applications, download, and install them the traditional way. Or so I thought, until I used the new store. Just like iOS, Apple makes installing and updating applications extremely easy from the new store. It has motivated me to install (and even buy) more software than ever before. 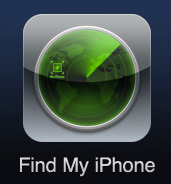 A week ago, my wife Caitlin had her iPhone 4 stolen at a local restaurant here in Raleigh. She was eating with some friends and decided to move outside near the end of the meal. The iPhone presumably slipped out of her pocket as she was getting up. A few minutes later she realized it was missing and went back inside to look for it, but the phone was gone. Her friends tried calling it, speaking with the restaurant staff, and searching all over but they couldn’t find the phone. She gave me a call and asked if I would log into Find My iPhone on the iPad to see if I could locate her phone. I pulled up her account and it began to locate her phone. Before long, an error appeared above the phone that said “Location Services Disabled”. Uh oh. I have been using Find My iPhone for nearly 2 years now (we have a MobileMe account) and I have never had an issue locating a device before. At the time, I wasn’t sure if the Location services were actually disabled, or if this meant that the phone was simply turned off. Since I was unable to locate the phone, I tried to use the “Send Message” feature. This feature allows you to send a message and play a beeping sound on the phone. This sound plays until you retrieve the phone and dismiss the notification. I sent a message (with sound) that said something like “Lost Phone. Please call ###-#### to return it!”. The Find My iPhone website seemed to indicate that the message was displayed properly on the device, and later Caitlin received an email confirming this. Great. While working on my blog this weekend, I stumbled upon the archives and started to read through some of my old posts. 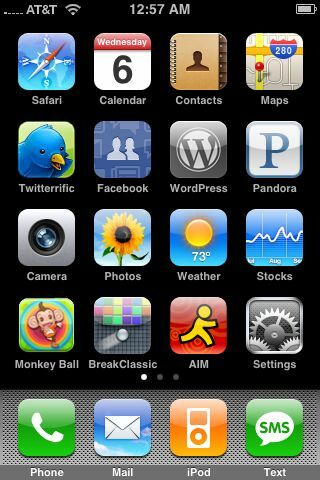 I found a screenshot of my iPhone home screen from August 2008. 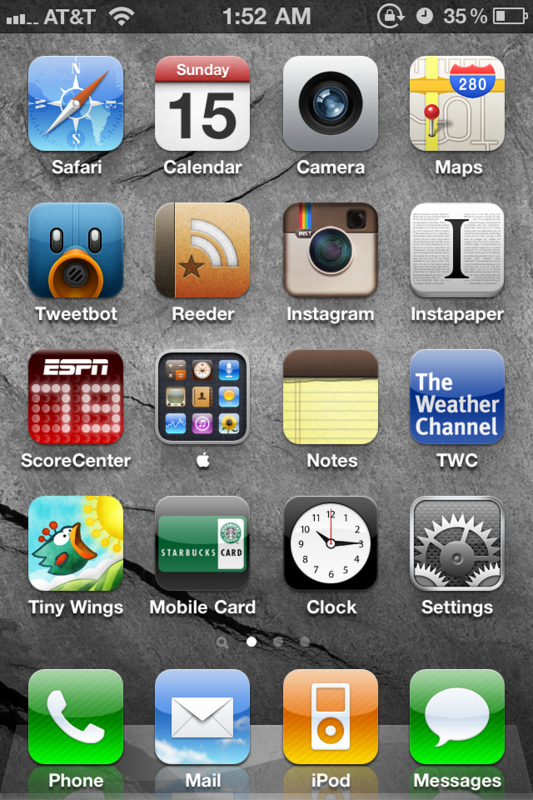 It’s fascinating to see the apps I was using back then and see how my “top apps” have changed over time. It’s cool to see how the Apple icons have changed, too. Check out that old “SMS Text” app. Over the past few months I have been carefully following the news and reviews about Blackberry’s new tablet, the Playbook. I’m not exactly sure why, but something about Blackberry has sparked my interest lately. (Basically, I think their future is looking disastrous… but that’s a topic for another day.) I’ve been surprised by the significant amount of advertising that Blackberry has been rolling out for the Playbook. I’ve seen tons of internet ads, and A LOT of Playbook ads during the NHL Playoffs as well. Blackberry has been running a few different ads, and each seems to have a slightly different marketing message. Is this for college kids? Gamers? Business Exectives? Email junkies?